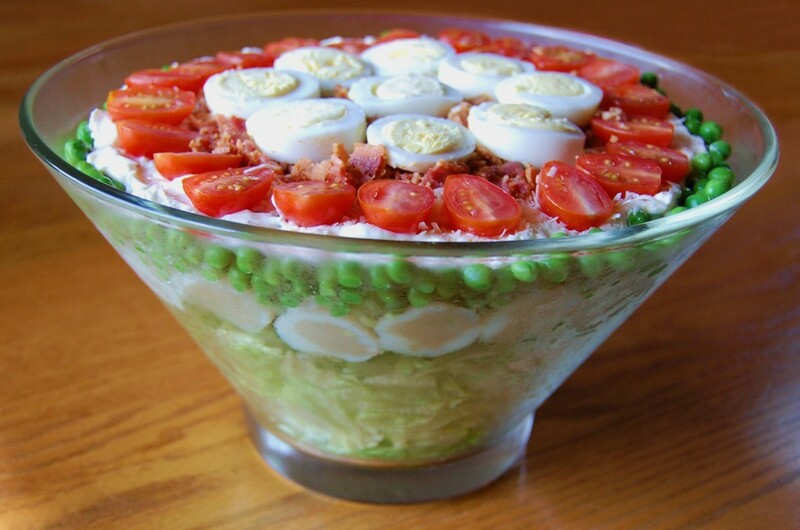 Crisp iceberg lettuce, celery, green onions, water chestnuts, green peas, hard boiled eggs, crumbled bacon and cherry tomatoes, topped with a seasoned mayonnaise dressing. Serve in a glass dish or bowl, to see all of the beautiful colors! 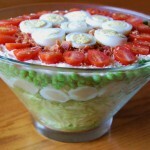 Layer vegetables in a 9x13-inch glass dish or bowl in the order listed above. Spread mayonnaise over the vegetables like icing. Sprinkle parmesan cheese, garlic powder, seasoning salt and sugar over mayonnaise. Garnish with sliced eggs, crumbled bacon and cherry tomatoes. Cover with plastic wrap and refrigerate overnight.